NTH evaluated the storm sewer system at the Monroe Power Plant for DTE Energy. Development of the Monroe Power Plant started in early 1968. The topography of the site is flat, which lead to the installation of three lift stations to collect and convey storm water runoff to the outlet. DTE has expanded their site through the years adding new buildings and more impervious pavement. The storm sewer network was modified and extended in pieces, without fully evaluating impacts on a system-wide basis. This led to significant flooding in parking lot areas during short duration, high-intensity storm events. 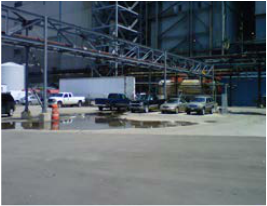 In addition to the exterior flooding, interior areas of the plant experienced flooding from floor drains. NTH used historical drawings and a new topographic survey of the site to develop a storm water model. The model was created using the Autodesk® Storm and Sanitary Analysis computer program, which is built on the storm water management model (SWMM) engine. The model was used as a tool to evaluate the existing storm network and identify deficiencies that might lead to the observed flooding. NTH developed and modeled various solution scenarios to mitigate the flooding concerns. The drainage area evaluated in the model covered 56 acres and the model contained approximately 170 storm manholes and catch basins. The recommended improvements could be phased in as a master planning tool or wholly implemented at one time. Recommended mitigation strategies included pipe upsizing, additional pumping capacity, additional catch basins for storm water interception and additional onsite storm water detention. The strategies were selected to meet the storm water management needs of the site, to limit the amount of outside agency review and approval, and to be fiscally sound. For the initial phase of the project, mitigating the interior flooding was the primary concern given the impact to site operations and safety. NTH was able to prove with the modeling and historical document research that existing modifications to the internal drainage system were unwarranted, and with some modification to process piping discharge, the originally proposed stormwater modification, costing approximately $10 million, could be eliminated. NTH served as the prime consultant, and with the assistance of our mechanical/plumbing sub consultants, developed detailed construction drawings and bid specifications for a retrofit that will eliminate the interior flooding and remove some flows from the external storm water conveyance system. This solution is costing only a fraction of the original proposed solution. Subsequent investigation is slated for the rest of the facility, focusing on the exterior collection and conveyance system. Detailed refinement of the site model is anticipated to yield a comprehensive, site-wideset of stormwater improvements to alleviate future flooding concerns at the site.